Let Country Bloomers make all your special days, EXTRA special with flowers! 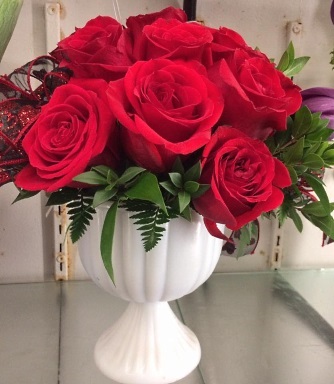 We’re a local Clarendon, Texas florist proudly serving the area over 20 years with a variety of fresh flowers, plants and creative gift choices to suit any style or budget. It is our pleasure to assist you with any local, as well as worldwide deliveries and remember that corporate accounts are always welcome. For your convenience, we offer daily floral delivery to local funeral homes and hospitals. Planning a Wedding, Party or Special Event? Whether it is formal or casual… a small gathering or the social event of the year… Country Bloomers can handle all your floral & on-site decorating needs. Call to schedule a consultation, so we can help you start planning your next special occasion! Great Gift Ideas for all ages & occasions… Green Plants, Blooming Plants, Dish Gardens, Fruit Baskets, Gourmet Baskets, Baby Gifts, Candy & Chocolates, Willow Tree Angels, Crosses, Circle E Candles, Greenleaf Candles & Home Fragrance Products, Silk Flowers, Picture Frames, Greeting Cards, Home Décor, Hen & Rooster Items, Plush Stuffed Animals and Balloons! In addition, we offer Candle & Tart Warmers, Scented Sachets as well a wide variety of Pocket Knives, including Case, Eye Brand, Hen & Rooster, Gerber & Kershaw brands. Country Bloomers is open to serve your floral and gift giving needs: Monday through Friday 9:00 to 5:30 and Saturday 9:00 to 2:00. Closed Sunday. We hope you enjoy your online shopping experience with secure 24-hour ordering right at your fingertips. If preferred, you may call us to place orders direct at (806) 874-2508 or 1-888-874-2508.Thank you for visiting our website with flowers delivered fresh from your local Clarendon, TX flower shop, Country Bloomers!